Heat oven to 425°F. Generously spray 15x10x1-inch pan with cooking spray. Between sheets of plastic wrap or waxed paper, flatten each pork chop to about 1/4-inch thickness. In shallow dish, mix crackers, Bisquick mix, paprika and pepper. In another shallow dish, beat egg and water. Dip pork chops into egg, then coat with Bisquick mixture. Repeat dipping coated pork in egg and in Bisquick mixture. Place in pan. Generously spray tops of pork with cooking spray. Bake about 20 minutes or until golden brown and no longer pink in center. Toss all apple slaw ingredients. Serve slaw with pork. Time Saver : Get a jump start on this recipe by making the cracker crumb mixture a day ahead. Keep it in a resealable plastic bag so it stays crisp and crunchy. 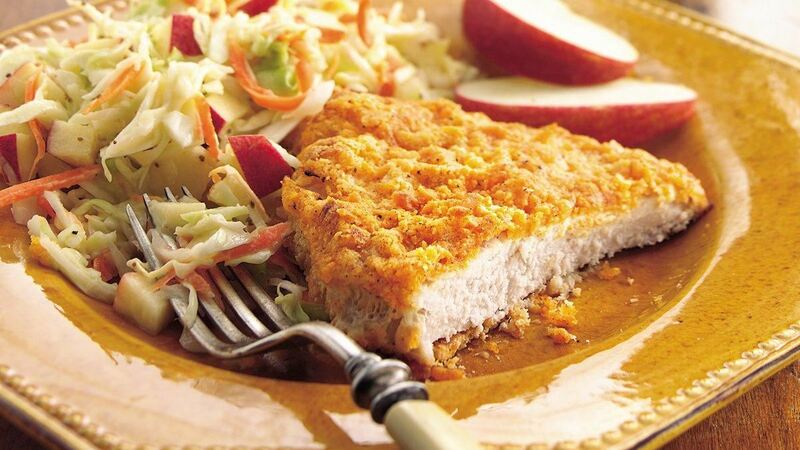 Variation : Instead of the pork cutlets, you can use boneless skinless chicken breast halves. Flatten the chicken as directed in step 1 for the pork chops, and continue as directed. Special Touch : Add some thin apple wedges around the edge of the serving platter for a pretty finish to this fabulous dish.